But first, a little bit about Google My Business and why it’s important. If you’re not interested and just want to set one up, skip ahead. If you don’t know what Google My Business is, you may have heard of it under one of its previous names, Google Places, Google Local Business or Google+ Business. The platform has grown and evolved over time, but simply, it’s a way for businesses to have a presence on Google and for the most important information to be shown in the search results. 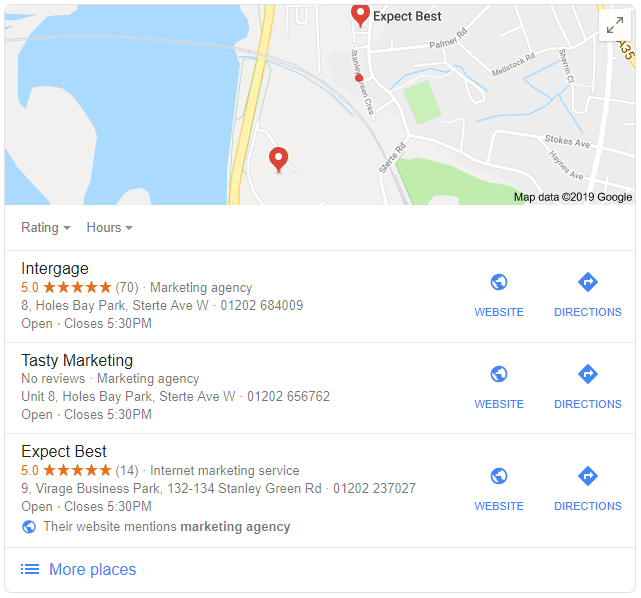 Google My Business is the panel that appears on the side of a Google search that gives all of the relevant information that you might need. Take this Google Search as an example. This is just naming a few and the majority of them, can be updated and should be kept updated with your business information. WHY DO I NEED A GOOGLE MY BUSINESS PROFILE? Google is all about making life easier for the searcher. Google My Business makes searching for the pertinent business information much easier, rather than relying on that information being readily available on the website. Searchers can at-a-glance find out what time their local Tesco closes this evening, simply by searching “Tesco”. Google’s smart enough to know which Tesco they’re talking about and surfaces the relevant information. For you, this means that Google shows you for local searches much more frequently. Based on how well you set up your Google My Business, your profile will be shown for searches outside of specific brand mentions. 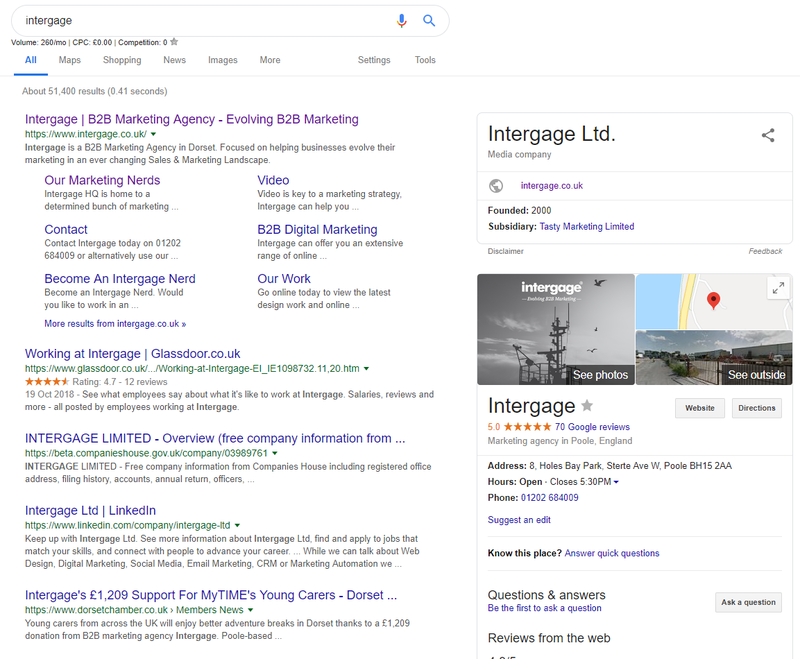 Here you can see that Intergage appears at the top of the “local pack” in a search for “Poole Marketing Agency”. This is due to our Google My Business set-up. The first step to setting up your Google My Business profile is to head to the sign-up page of Google My Business. Hit the “Start Now” button, which does exactly what you would expect. Business Name doesn’t have to be 100% exact to your legal business name, however it should be as close to what best represents your business. For instance you don’t need to include “ltd” or “plc” at the end, however consistency is key here. You should put in this field the same wording that you’ve put in everywhere else. 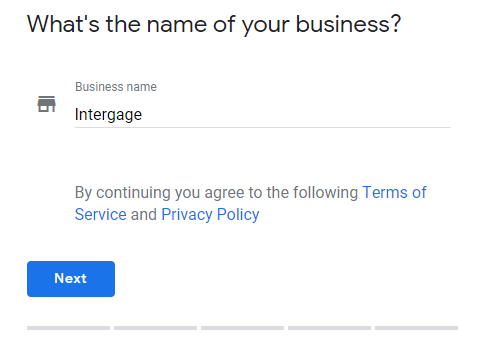 If there’s already an account set up with your business name, in your location, you can select it here and you’ll be prompted with how to recover the account. Location is one of the most important fields. This is your business address and where the “pin” would fall on the map when highlighting your business. If you deliver goods and services to your customers then make sure you have that box checked. Business Category. You’ll be asked to fill in your business category. It’s important that you get this as accurate as possible, as it influences how people may find your business when searching for similar businesses. Verifying your business is simple. Google will send you a postcard with a special code on it to your specified business address. When you receive it, you input your code into my Business and you’ve now verified the account. Simple! You can also verify by phone, and occasionally by email. 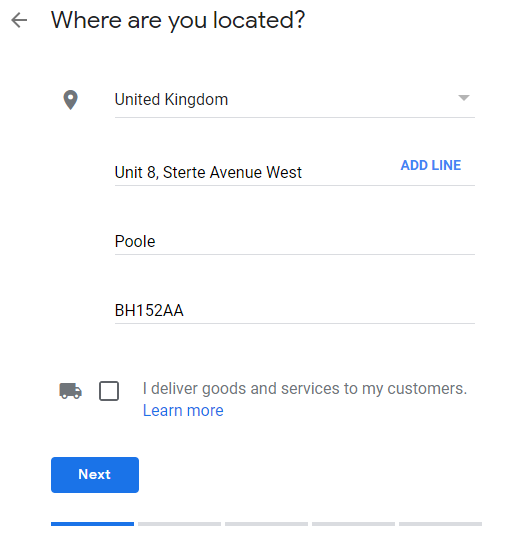 Optimising your Google My Business listing is done from your dashboard and is about making your business recognisable, explicit and efficient in the information it portrays. This is about making your My Business listing as identifiable as your business as possible. It draws the searcher’s eye to your business panel, rather than to the search results where they could potentially get distracted by your competitors or by adverts. Primarily, this is done with clear images. Images should be at least 720px wide and 720px tall, so they remain crisp and clear. Your most prominent image is your Cover Photo, the first image you see on the panel. For clients like ours, who operate predominantly in the B2B space, we recommend an image that gives brand recognition, such as a branded image that lines up with your business offering. This could be a picture of your product, a process or service. We do not recommend that you use a logo here, that’s what the Profile Picture is for. Your profile picture is what shows up when you post a reply to a review, post a photo or comment, for instance. This should be instantly recognisable and representative of your company, even when reduced in size. For this we would recommend a logo, or a head shot of a figurehead of your company. There are multiple other kinds of photos that Google recommends you upload and each has its benefits depending on the kind of business that you are. For instance, “food” images are much more relevant and helpful to a restaurant than to an engineering company. Upload high quality images where you feel they are relevant. Remember, these are images that people will see when searching for your business, so they should be as high quality as possible. If you have a brand video available you can upload it to your My Business profile. 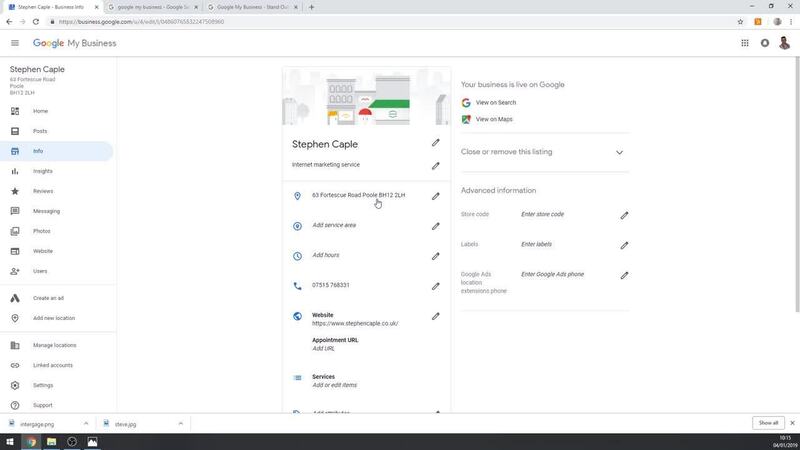 They aren’t shown in the panel upon a Google search, but they are available if a user feels they would like to understand more about your business. If people stumble upon your business listing via a search that is not for your brand, you’re going to need to briefly explain what your company does, and how it helps. You only have a few characters to do this, so be brief and clear. This shows what hours you're open to your customer, customised to the day that they’re searching on. Update this section with the daily working hours of your business. Don’t forget to update your My Business listing during holidays to ensure that searcher’s know when you’re open or not. Include your phone number here. Google will feedback to you on how many times a person has clicked on your phone number from a mobile in order to initiate a phone call with your business. This won’t tell you about people who’ve copied your number down first. So if you have a special trackable number, you may wish to use this here. This is the address for your website. Make sure you include https:// or http:// . If this changes in anyway, (including the https part) you should update your My Business page. 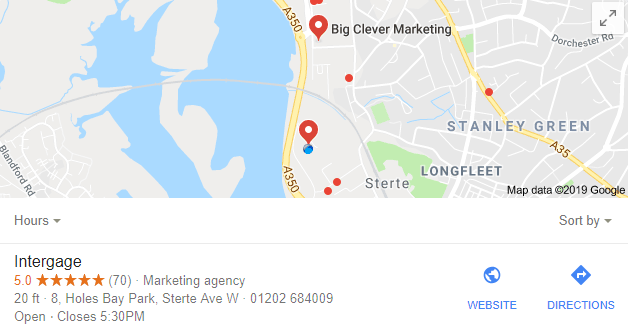 Google My Business pages are a valuable asset, and allow you to share business updates and maintain a high level brand presence, if you keep them regularly up to date. Next time, I’m going to go through everything you can do to keep your Google My Business up to date.